"I came across Holiday Tots when looking for a toddler friendly place to stay in Normandy last summer. The gite we stayed in far exceeded our expectations - it was completely and carefully set up for toddlers, with indoor and outdoor toys, but also with all the safety features we needed. I knew it would be good, but I was instantly relaxed because my daughter was playing on the ride on toys and was blissfully happy within two minutes of arriving! Just as importantly, the service from Holiday Tots was amazing all the way through, from helping us to select the right place, to ensuring we were able to make contact and complete the booking. We had such a good time on our first Holiday Tots holiday, that we booked another as soon as we could - we're off to Portugal this time and really looking forward to it. I recommend the team for their expert knowledge and advice, and for the truly great properties. It's so nice to book somewhere and know it will have all you need for your little ones!" "Holidaytots service is superb. Sachelle is really helpful with options and availability and has lots of good suggestions to make booking a holiday that little bit easier. They are by far the best of the toddler friendly sites we have used, and a real bonus for a busy working mum"
"Thank you again for a lovely holiday, we are all feeling very recharged! property ref JCDC Silver Coast Portugal "
"The owners were very organised and helpful in the run up to our holiday. The villa was so clean, well equipped and had everything we needed for a holiday with two infants. My family had our best holiday so far – my 19 month-old son was delightful and his speech came on so much – which I put down to his being entertained, rested and happy"
"We’ve found the service provided to be excellent. You have been very helpful in answering our queries, proactive in checking everything is ok and open and communicative throughout the whole process. An excellent property in your portfolio and perfect for a toddler." "We received a very supportive service and particularly like the Top 10 including rainy weather ideas! Holiday Tots took our needs into consideration which is so important when you are taking your little one away for the first time. I felt this was one of the main benefits that I could ask all the questions I needed to and got a personal and prompt answer. I would use Holiday Tots again next year and recommend it because of the pre-holiday service and because the accommodation description is so accurate, (which I haven’t really experienced before)." "The information on Holiday Tots was useful and I received quick responses to any queries. 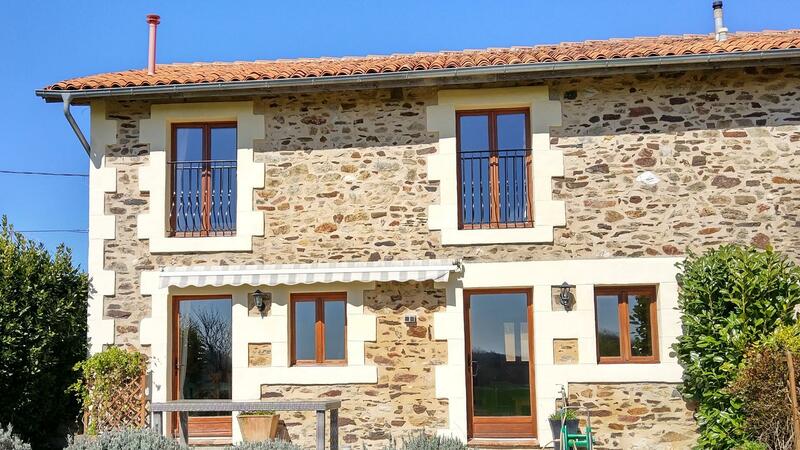 The property was gorgeous, we were very pleased with both the gite and the grounds. The owners were great and made us feel very welcome." "Fantastic, friendly and very efficient service. It is always hard going away with young children but the needs addressed made for a considerably easier vacation." "Our holiday was lovely thank you - I have recommended it to everyone and told all my friends about your website!! We received a very supportive service with questions answered promptly. The website is easy to use and the photos of the properties are very realistic exactly as the property is in the flesh. Hopefully, we will be visiting the website again next year." "The service we received from Holiday Tots was very speedy and helpful and the suggestions for local activities were good too. We had “eat in your gite” for four nights which was delicious and really made it a holiday for me." "Have had a fantastic holiday with my family and the first with our 9 month old baby. The overall process was excellent and straight forward and the property was amazing, we will definitely be using holiday tots in the future." "The Holiday Tots service was excellent. We stayed in a really great place. We loved it!" "I was really unsure about how our first holiday was going to go with the little one. Thank you so much for arranging everything it really was perfect! We will recommend your website to the local mums & dads we know." "Love Holiday Tots. We have had 3 good holidays with you. (now back for 4th!)" "“Thank you for all your help with our holiday this year. You found us the perfect property and it was all so quick and easy to book. We had a fantastic holiday with everything we needed for the kids and the property was absolutely lovely! We’ll definitely be back in touch for our next holiday!”"